One of many iconic landscapes in Yosemite National Park is a wide-open grassy stretch mixed with high granite outcrops called Tuolumne Meadows. Millions of visitors have stopped there in wonder. Geologists love a good view as much as anyone, but sooner or later they ask themselves the strange but typical question, "How did this landscape happen?" 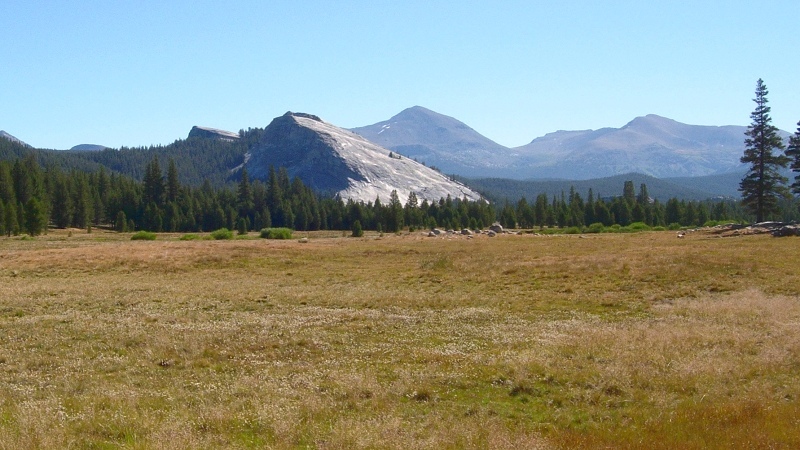 Tuolumne Meadows is a long-standing geological puzzle—a large relatively flat place in the midst of a rugged range. 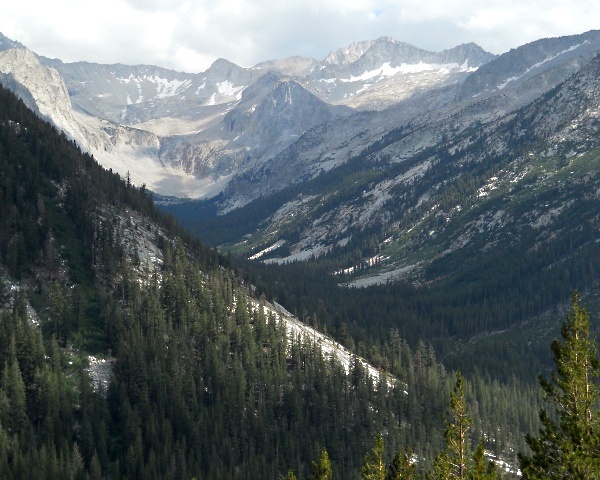 Like most of the high Sierra valleys, the Meadows were covered by ice age glaciers until very recently (in geologic time), just 12,000 years ago or so. 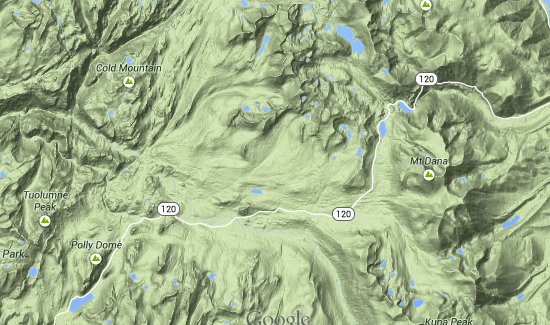 So in the Sierra, the geologists' question usually boils down to "How did the glaciers make this landscape?" At Tuolumne Meadows, their question is "How the heck?" Tuolumne Meadows is geologically weird because it mixes a wide flat area, typical of weak bedrock, with big humps of clean strong stone, like Lembert Dome, exposed like sculpture in a gallery. But the whole area is in one large body of identical granite, the Cathedral Peak Granodiorite. (Granodiorite has a slightly different blend of minerals from true granite; only geologists notice. 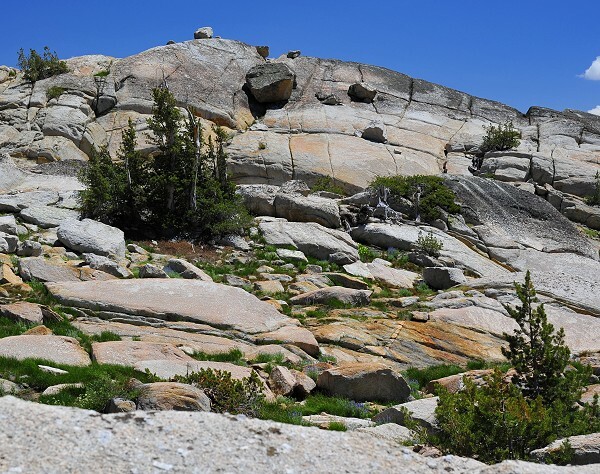 Most of the Sierra's beautiful white "granite" is granodiorite.) The clean crags that Yosemite rock climbers love are cheek by jowl with flat, well-eroded meadows, all in the same rock. 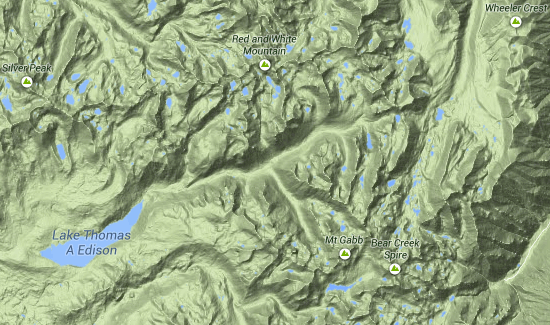 How did the glaciers carve the same stuff into such a variety of landforms? Geologist Richard Becker and three colleagues have unraveled the puzzle in a new paper for GSA Today (open access). They say the key is the cracks in the granite. Long ago, for nearly a hundred million years, the land we know as the Sierra Nevada was a huge belt of volcanoes, similar to Japan today. Japan gets its volcanism as a result of plate tectonics. The Pacific plate is being pulled westward under Japan where it sinks from its own weight, and as the plate subducts, its material partially melts into water-rich, highly fluid magma that slowly moves upward to erupt in Fujiyama and hundreds of other volcanoes. Deeper down, that same process creates bodies of slow-cooled granite. In California those granite bodies, which once fed magma and fluids to ancient volcanoes above them, have been uncovered by millions of years of erosion. The Cathedral Peak Granodiorite is a former intrusion of magma that solidified about 88.1 million years ago. Soon afterward (85.4 million years ago) another body of granite pushed its way into the area, feeding its own generation of volcanoes as it came. Fluids rising from it through the older granite created peculiar clusters of cracks. Becker and his coauthors have described these in previous papers and given them the name of tabular fracture clusters, or TFCs. TFCs are not like the typical cracks in granite, which are classified by geologists as joints. They're shattered zones, tightly clustered bundles of cracks, that may be a meter wide. The ice age glaciers found those fractures easy digging. Where TFCs are scattered, glaciers carved them into deep grooves. Where they're closely spaced, glaciers could also break the hard rock between them and scrape the land down wholesale. Tuolumne Meadows has two large sets of abundant TFCs, arranged in different directions, that cut the granite into blocks as effectively as a knife slicing up a pan of brownies. Just to make sure of their findings, Becker's team examined another part of the Sierra, the Mono Recesses, where the granite is almost identical but where TFCs are rare. There the glaciers carved a textbook alpine terrain of narrow, U-shaped valleys—another climber's playground—without wide meadows. It's just as grand, but a different kind of beautiful. 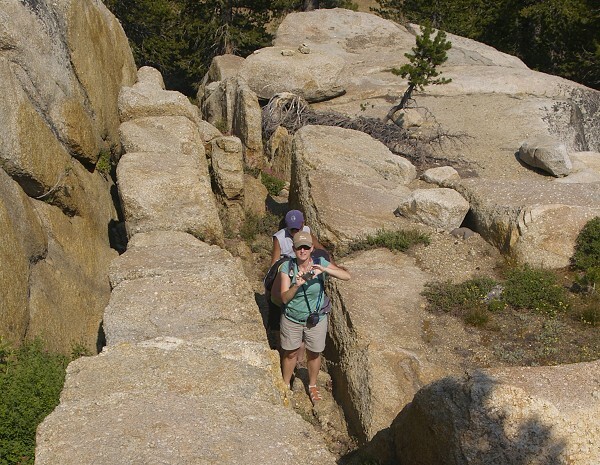 Deep events of 85 million years ago left tracks at Tuolumne Meadows that the glaciers followed as they carved a geological sculpture garden in the high Yosemite country.